‘Infinitely Loire’. Such is the leading statement on the website of a producer of top quality sparkling wines in the Loire Valley. The company is called Louis de Grenelle, known as Caves de Grenelle, and is located in the heart of the historic town of Saumur, with its impressive chateau overlooking the great river. Sparkling Saumur wine is made by the traditional method, with the secondary fermentation that produces the fizz, taking place in the bottle, just like in making champagne. The grape varieties, however, are normally different to those used for champagne, hence imparting different flavours. The statement on the website refers to the character of the wines, and sparkling Saumur epitomises the beauty, harmony and tranquillity of the Loire wine region. Founded in 1859, Caves de Grenelle is one of only nine producers of sparkling Saumur and the only one to still be family owned and managed. A vigneron producing wine at nearby Chateau Durandière, had the good fortune and good sense to acquire the company soon after the Second World War, when, due to various circumstances, it had almost gone bust. 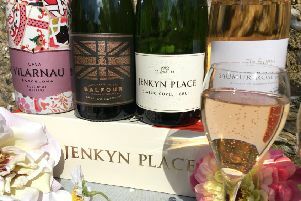 Since then, it’s gone from strength to strength, with a relentless policy of making the best quality sparkling wine of the area. Caves de Grenelle is the last of the great family houses of Saumur to still be producing sparkling wines independently. The founder’s daughter, Madame Françoise Flao, took over the reins a few years ago, and the grandsons are becoming increasingly involved. The ‘caves’ themselves are located just under the winery administrative buildings and tasting room and extend to an impressive 5 kilometres, where the wines are matured at a constant 12 degrees C. The maze of tunnels was originally carved out of the soft limestone, known as tuffeau, in order to produce stone for the buildings of Saumur, principally in the 17th, 18th and 19th centuries. Each tunnel has a name and the network of tunnels, together with many others under the town, are considered to be more extensive than the entire town’s streets above ground. Although Caves Louis de Grenelle exports some wine to the US, Japan and the UK, the vast majority is sold on the domestic market, with much of that being local to Saumur. Quality throughout the range is exceptional and the wines can be a real alternative to champagne. With great attention to detail, and combining years of artisan experience with all the latest wine-making technology, the company produces a range of wines which are delicate, refined and complex. Madame Flao favours quality over quantity and has forged the Louis de Grenelle style without compromising the house’s spirit. The Saumur Brut, named ‘Ivoire’, is made from a blend of 80 percent Chenin Blanc – one of the indomitable Loire Valley white grape varieties – and 20 percent Chardonnay, and is non-vintage, using some reserve wines from earlier years. With a low dosage of only 7 to 8 g/l, the wine is dry, fresh and crisp, with an elegant, refreshing finish. The Crémant de Loire, called ‘Platine’, has a small amount of the red grape variety Cabernet Franc – another Loire classic – in the blend. Giving a little more fruit on the palate. It also comes from a single year’s harvest, currently 2014. The range also includes a Rosé, a delicious, refined and complex Vintage 2009 from 100 percent Chenin Blanc and two very special Cuvées. The Grande Cuvée is aged for 30 months on the lees in bottle and is produced from very high-quality grapes grown in only two vineyards. A very, elegant and complex wine, with aromas of toasted hazelnuts and dried apricots, with a long finish on the palate. But for me, the ultimate speciality is a wine in a squat-shaped bottle, curiously named ‘3 / 7.7.4’. It is a Blanc de Noirs, that is a white wine made from black grapes. The figure ‘3’ relates to the three grape varieties – Pinot Noir, Cabernet Franc and Pinot d’Aunis – and the other figures are the proportions used of each in the blend. A sparkling wine of tremendous quality, oozing elegance and deep, red fruit flavours. Definitely worth a visit to the lovely town of Saumur in the Loire Valley.